LAS VEGAS – Major League Baseball’s annual Winter Meetings normally produces the biggest offseason signings and announcements of changes in the sport. “I had no idea because a lot of times you can you see the player, you see that stands, you see the fans but you don’t see the other side of it how do you get into as a concession,” says Jonathan Burgess, part of a twin business dynamic who markets and sells “innovative” soul food items such as their signature “churwaffle,” a dish made with a cornbread waffle. “Events like this provide an opportunity give us a seat at the table, and it’s up to us and to take the next step and develop relationships to move it forward, possibly represent your organization, and pave the way for other businesses to get into major league ballparks and to do business with Major League Baseball,” says Matthew Burgess. The Arizona Diamondbacks brought Pheonix-area Lo-Lo’s Chicken and Waffles into Chase Field in 2015. In 2018 the New York Mets installed a Sweet Chick soul food restaurant franchise location at Citi Field called “Lil Sweet Chick.” Queens native hip hop artist and part owner of Sweet Chick Nas was instrumental with working with MLB to create the Sweet Chick partnership. 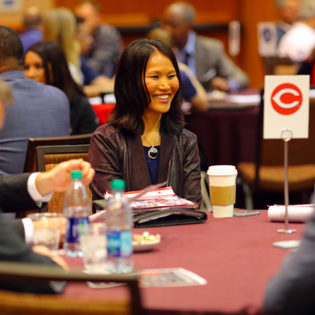 Colin Hinds, an African American former minor league baseball player who is Head of Strategic Partnerships at Smoother and friend of Krober’s, believes the difference in success for diverse businesses comes down to access. “People commonly will deal with other people around them, so very naturally the people on my block look like me. So if I’m doing business with the people on my block they’re going to know some information that the people the block over don’t know. The dynamic of really being able to allow for vendors to come into that space, to just to be on the same block and to be able to have those conversations is just good business,” explains Hinds.